At the Four Girls Mountains, the sunny weather in summer is most in July. Incidentally, it is in July that two mountaineering parties (Doshisha University and Hiroshima Mountain Club) made first ascent at the southeastern ridge and the southern wall. In an average year, the weather what is like a ending of the rainy season comes in early July. For about 1 week just after that, it is especially beautiful what the flower and the green are shine out freshly on the snow-covered mountain and blue sky. 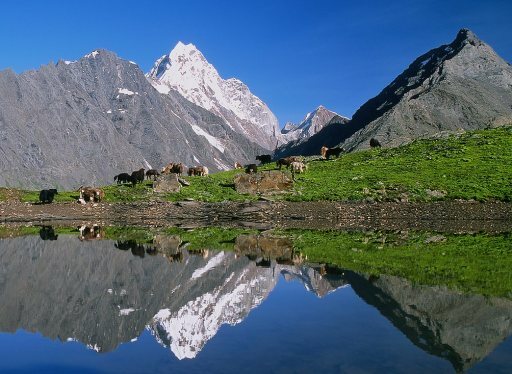 The photograph is the highest peak 6250m and a herd of yak what is reflected on the Rhinoceros-cow Lakes 4400m at the source of the Lake Valley. This beautiful lake is named from a local legend what the yak descend to earth from the heaven. If you see a sight what the herd of yak grazing and bathing around the lakes in summer, you will consent to the origin of the name. On the upper side of Rhinoceros-cow Lakes, there is a mountain pass leads to the Wolong where is famous with the giant panda. Then, the herd of yak what escapes from the heat and the peoples who pick up a medicinal herb or carry on commerce passes here sometimes. Also, there are various landforms like a grassy plain with slight slope and the steep rocky stretch around the lakes. And the various flowers such as the blue poppy blooms from the spring to the autumn. The grassy plain with slight slope where the various flowers bloom is spreading to the whole source of the Lake Valley, and there are many lakes of the glacial origin under the steep mountain ridge what surround it. The Rhinoceros-cow Lakes what is one of these lakes commands a view of the flower field what is spreading to here and there on the whole source of the Lake Valley. A big fall what running from the Twins Lakes 4600m can be seen toward the opposite of the valley, too. Not only the Rhinoceros-cow Lakes, the management bureau prohibits a camping and garbage leaving at the lakeshore to water pollution control in Four Girls Mountains. When the readers visited, please cooperate in this rule.